Flyers from a white nationalist group were dispersed without approval at Tarleton State University during spring break. 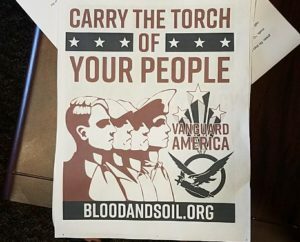 The flyers found outside of the Fine Arts building can be found on Vanguard America’s website, bloodandsoil.org. Three flyers were found outside of the Fine Arts building. 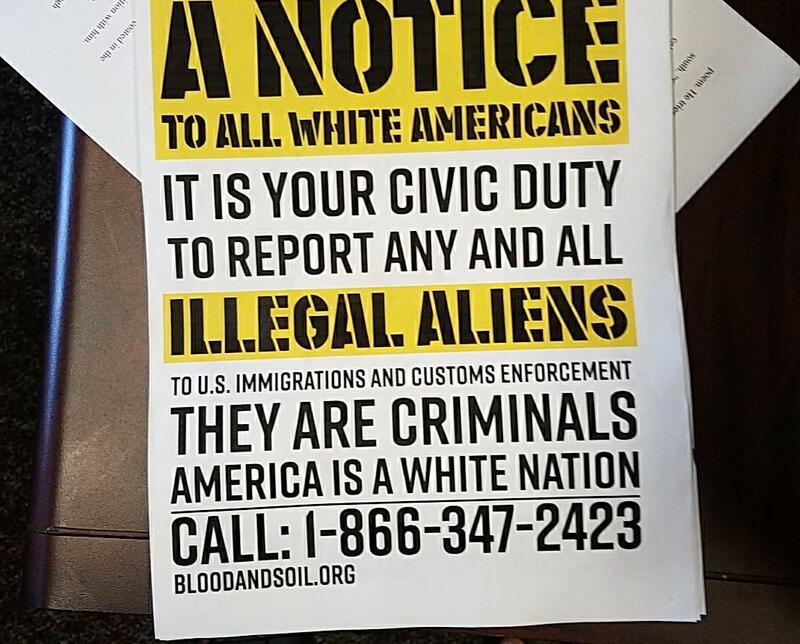 One flyer encourages “white Americans” to report illegal immigration, another reads “Carry the torch of your people” and a third flyer reads “Protect the Family” with a black and white illustration of a man and a woman. Tanter said she met the student on campus and the two of them took down the flyers. She went to the O.A Grant building to see if any of the flyers were dispersed there, but did not find any. Tanter then contacted police Chief Matt Welch, who suggested she file a police report about the incident. Although no violation of the law occurred, Welch says he suggested that Tanter file the information report to document what happened. “The police took it seriously, which I appreciated,” Tanter said. Tanter says her reaction to the flyers was, “disgust, absolute disgust.” She also said that she had seen the flyer telling white Americans that it is their “civic duty” to report immigration on Facebook, before finding out about flyers being on campus. Tanter said the flyers are an affront to one of the university’s core values. 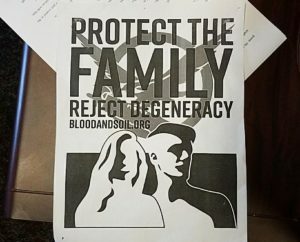 “Protect The Family”, “Reject Degeneracy” flyer found. Photo courtesy of Dr. Marcy Tanter. Like Tanter, Warner said she had heard about the messages the flyers through Facebook, prior to finding out about them on campus. Colton Sheffield, Tarleton’s student body president, said he was caught “off guard” by the flyers. Sheffield also says that the flyers do no not adhere to Tarleton’s core values, specifically the value of civility. “It does reflect poorly on Tarleton’s core values- one being civility. Sheffield says he acknowledges the constitutional right of freedom of speech, but does not support the message of the flyers and urges his peers not to support them either. “Right now, it’s just words, but if the Blood and Soil or the Vanguards of America, approach you violently, call me first because I’m coming…. This isn’t right. As soon as they start threatening physical harm, I’m going to be there to stop it because I don’t agree with it because posters is one thing, but acting on it is different,” said Sheffield. On Feb. 1, the website bloodandsoil.org, Vanguard America what it called “The Texan Offensive,” which it described as effort to distribute their posters on the campuses of Texas State University, Rice University, the University of North Texas, the University of Texas at Dallas, Collin College, Abilene Christian University. (Tarleton State University was not listed).